You are here: Home / Delivery / Watch my PechaKucha presentation! 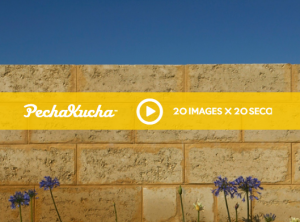 Do you know what PechaKucha is? I describe it in an earlier blog post, “Stay focused with Pecha Kucha.” And I wrote about my experience giving my first PechaKucha here. Briefly, a PechaKucha is a short, structured presentation, only 6 minutes, 40 seconds long. I had practically forgotten about it, because it was more than 2 years ago. My assistant was looking at the PechaKucha website and clicked the Most Viewed and Most Applauded tabs and found my PechaKucha! My presentation is #3 on the Most Viewed tab and #2 on the Most Applauded tab. We were both surprised, especially since I’ve never given anyone the online link. You can watch it here. After all, it’s only 6 minutes, 40 seconds long! If you like it, please click the APPLAUD THIS button! And let me know what you think in the comments. And if you think the presentation is valuable, please share this post with the Share buttons because your friends might find it valuable too. Well-done, Ellen. As a professional speaker and speaking coach, I always advise to NOT close with “thank you” as you did. This lacks any real punch; let me know if you’d like my assistance with this skill. Dale, I even have a blog post on that topic, http://www.ellenfinkelstein.com/pptblog/should-you-say-thank-you-at-the-end-of-a-presentation/. As you’ll read in the comments, there are strong opposing opinions on this question.